"Only for this moment have the generations of my fathers lived. I have been used. You have been used. Mankind has been used." 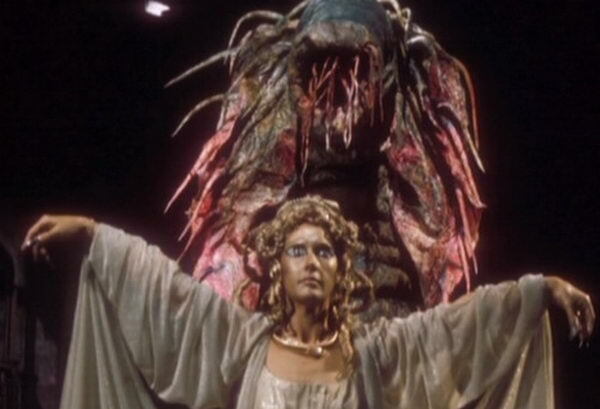 ‘Image of the Fendahl’ brings to an end Robert Holmes’ glorious tenure as Doctor Who script-editor and with him the show’s Gothic era. Written by the dependable Chris Boucher (his final script for the series), it’s a fitting swan song, featuring almost everything that has become synonymous with this era; mad scientists, isolated country manors, mysterious deaths, secret societies, horrid monsters, ancient evils and even a dollop of old school magic, personified here by Ma Tyler (no relation to Rose), an old crone who communicates only in Mummerset gibberish. Of course, this being Doctor Who, there is a scientific rationale for Ma Tyler's powers. The Doctor concludes that her psychic abilities are a result of growing up near a time thingy, an idea Mark Gatiss would revisit decades later in ‘The Unquiet Dead’. It's brilliantly directed by George Spenton-Foster. So much so that I wish he'd directed more stories for the show (he only directed one other story after this one). One thing Classic Who was always in need of was quality directors. The opening scenes are a master class in restrained dread. There’s something very Evil Dead about these scenes. Rarely has the show been this unashamedly spine-chilling. The decision to use very little incidental music works in the story's favour. Horror always works best when there isn't an orchestra telling us what to feel. One area where the story falters is in the depiction of the monsters. The Fendahleen worked better as creepy sound effects stalking the misty woods, preying on unsuspecting hikers. Once they are finally revealed in their true form they inevitably disappoint. The Fendahl itself, the latest in a long line of ancient aliens to have influenced humanity's development for its own benefit, was also scarier when it was just a skull that occasionally glowed in the dark. After it has taken over Thea it looks like a refugee from some bonkers music video. --The Doctor kills the Fendahleen with a gun loaded with rock salt. How very Winchester. --Just who the hell let him out of the storage cupboard? We never do find out. Was it Adam? Thea? Max? Casper the Friendly Ghost? --Fendleman’s outrageous accent seems to be doing a tour around most of continental Europe. --Exterior scenes were shot at Mick Jagger‘s Stargroves estate in Hampshire, the same location had been used for ‘Pyramids of Mars’. --Poor K-9 is left all alone in the TARDIS. Maybe this tale was just too frightening for tin dogs. --Leela has a new dress, one that is even skimpier than her usual one. --Even though we don't see Max shoot Fendleman in the head, seeing his corpse with blood pouring from the hole is rather much for this show. --The Doctor has a very interesting recipe for fruit cake. --Leela has figured out that the Doctor can't work the TARDIS. And he does always call her 'she'. --Wanda Ventham (Thea) is the mother of some actor called Benedict Cumberbatch. 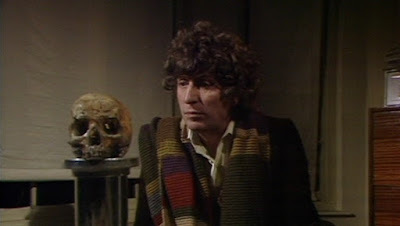 --The Doctor might say Jelly Baby, but that was clearly a Liquorice Allsort he offered the skull. Adam Colby: "You must think my head zips up at the back." The Doctor: "There are four thousand million people here on your planet, and if I'm right, within a year, there will just be one left alive. Just one." Adam Colby: "What are you exactly, some sort of wandering Armageddon peddler?" Adam Colby: "Are you saying that about twelve million years ago, on a nameless planet which no longer exists, evolution went up a blind alley? Natural selection turned back on itself, and a creature evolved which prospered by absorbing the energy wavelengths of life itself? It ate life, all life, including that of its own kind?" The Doctor: "Yes. In other words, the Fendahl. Then the Time Lords decided to destroy the entire planet, and hid the fact from posterity. They're not supposed to do that sort of thing, you know." Leela: "He came armed and silent." The Doctor: "You must have been sent by providence." Ted Moss: "No, I was sent by the council to cut the verges." Leela: "Your council should choose its warriors more carefully." Three out of four Mummerset accents. One of the few classic Who episodes I've thoroughly enjoyed, and that was even before I knew who the actress playing Thea was! One thing this review didn't mention was how good the banter between the Doctor and Leela continues to be. Sarah Jane was plucky, but she was still very much an assistant. Leela acts as the Doctor's bodyguard, calls him out on his inconsistencies, and fights the enemy rather than just screaming to let the Doctor know of their arrival. Very Donna-like, now that I think about it.